A World War One soldier, excluded from a war memorial because he was "born out of wedlock", is to have his name added in his home town. 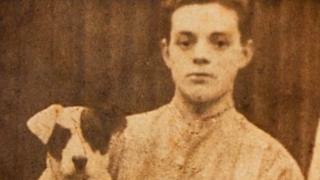 Driver Ben Cobey, 19, from Maldon, Essex, was killed on 26 August 1914. Unlike his colleagues, he was not awarded a Victoria Cross and was left off two war memorials in his birth place. His relatives, who have campaigned for him to be honoured, will travel to Maldon for a service on Sunday. Maldon's mayor Stephen Nunn, who is also a historian, said Driver Cobey's name was likely to have been missed off the church plaque because he was illegitimate. The church has now agreed to add his name to its memorial. He has also been added to the town's main war memorial. One of Driver Cobey's relatives, Robert Dunn, said the lack of a Victoria Cross might be because he died within a month of the conflict beginning. "It was early days, yet people were dying already. I'm sure it wouldn't have been a good news story for the government," Mr Dunn, 71, said. He said he did not mind if an official Victoria Cross medal was issued or not - he said he just wanted "the recognition of being able to put those letters after Ben's name". Mr Nunn, who has joined the campaign to recognise Driver Cobey's efforts with a Victoria Cross, said the award would be "the icing on the cake". The Ministry of Defence, which deals with Victoria Cross awards, has been approached for a comment. Mr Dunn and another relative, Bill Francis, will remember Driver Cobey's life during a service in Maldon on Sunday. "I just feel it's where I should be. I've been so touched by support I've had from people in Maldon. It means a great deal," said Mr Dunn.